The tibial plateau is made up of three osseous structures: the lateral plateau, the medial plateau, along with the intercondylar eminence. The lateral plateau is smaller as well as convex, while the medial plateau is larger and slightly concave. Meniscus covers both of the plateaus, which improves the congruency of the femorotibial joint and functions as a shock absorber. Compared to the medial joint surface the lateral plateau is located slightly higher, an angle of 3 degrees of varus is created with respect to the tibial shaft. This is effective in recognizing the lateral plateau on the lateral radiograph. An unusual weight division is caused due to the anatomy of the tibial plateau, in which 40% of the knee’s load is taken by the lateral plateau. Improved medial subchondral bone formation as well as a stronger, denser medial plateau emerges as a result of this asymmetric weight bearing. The tibial connection of the anterior along with posterior cruciate ligaments is given by the intermediate, nonarticular intercondylar eminence. The cruciate ligaments, the collateral ligaments, and the capsule maintain the stability of the knee joint. Specifically for insertion of the patellar tendon and the iliotibial tract, the bony protrusions, tibial tuberosity as well as the tubercle of Gerdy are located within the subcondylar zone. These landmarks are important for preparation of surgical incisions. A tibial plateau fracture is a disruption of the upper portion of the tibia a.k.a. shinbone that is a component of the knee joint. Symptoms consist of pain, swelling, along with a decreased capability in order to move the knee. People are generally unable to walk. Complication may include injury to the artery or nerve, arthritis, and compartment syndrome. Generally it is caused due to damage such as a fall or vehicle crash. Osteoporosis and certain sports such as skiing are involved among the risk factors. Conviction and Diagnosis of fracture is typically based on symptoms and validated along with the help of X-rays as well as a CT scan. 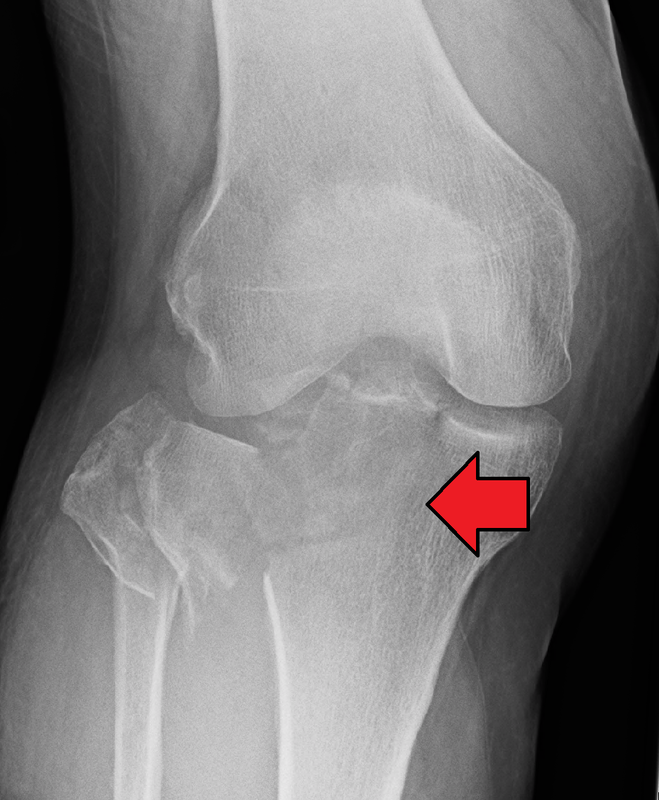 Some fractures are not visible on plain X-rays. Pain may be coped with NSAIDs, opioids, and splinting. In those who are otherwise healthy, treatment is generally by surgery. Occasionally, if the bones are well aligned and the ligaments of the knee are intact, people may be treated without surgery. Numerous classifications have been introduced over the years. The categories encompass many fracture configurations but are so broad that comparisons of treatment results are meaningless. Fractures can be described as minor or major and undisplaced or displaced. Compression may occur in either the medial or lateral compartment. Fractures may involve compression of one small fragment or a major fragment. The Schatzker classification is a common classification of tibial plateau fractures. Strong forces directed medially or laterally at the knee joint, combined with axial loading, cause the majority of proximal tibial plateau fractures. Automobile accidents account for 40-60% of all tibial plateau fractures. Other mechanisms include falls from heights, slipping and twisting, sport injuries, and motorcycle and bicycle accidents. About 15-45% of fractures include a ligamentous rupture, commonly of the medial or lateral collateral ligaments. Meniscal lesions occur in approximately 20% of all tibial plateau fractures. Some tibial plateau fractures are quite minor and are caused by falls or minor missteps among the elderly.